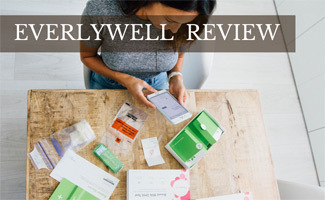 Home > Health > Physical Health > EverlyWell Review: Are Its Health & Well-Being Insights Reliable? Consumer health startup EverlyWell got its big break in late 2017 when its CEO, Julia Cheek, secured a $1 million investment from the hit TV show Shark Tank. Fast forward more than a year later, and this burgeoning business is making a name for itself and garnering some significant partnerships to propel its at-home health testing business. Are EverlyWell’s tests accurate? And what can you learn from the 30 separate tests this company offers? Easy fingerprick, saliva or urinary collection with detailed instructions. Results show specific values and where these values land on a scale of low, normal and high. You get actionable insights based on your results. Only uses labs certified according to the Clinical Laboratory Improvement Amendments of 1988 (CLIA). These include federal standards for all U.S. facilities that test human specimens for health assessment or to diagnose, prevent or treat disease. All tests are covered by Health Savings Account and Flexible Spending Account plans. Partners with Helix’s DNA sequencing lab for the three genomic tests offered (Food Sensitivity+, Metabolism+, DHA+). Helix is the same DNA lab used by National Geographic’s DNA test. What Tests Does EverlyWell Offer? EverlyWell offers an impressive 30 separate at-home health tests. Here are some details about its two most popular tests. Click here to see all tests and pricing. Who should consider this test? If you suffer from frequent digestive issues and bloating or fatigue, headaches and other symptoms after eating, this test could shed some light into foods your body may not tolerate well. EverlyWell’s Food Sensitivity Test measures your body’s immune response to 96 foods to help provide guidance on what foods you may want to eliminate from your diet, including gluten, dairy, wheat, nuts, soy, yeast and more. Keep in mind: this test doesn’t diagnose serious food allergies; rather, it looks at food reactivity. What does food reactivity mean? It’s a delayed immune response by the Immunoglobulin G (IgG) antibody, the most abundant circulating antibody in our immune system. 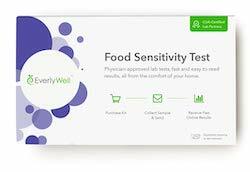 EverlyWell’s Food Sensitivity Test is a finger prick blood test, and results give you a possible indication that you could react from certain foods with a low, mild, moderate or high level. Who should consider this test? If you’re concerned about your metabolism, energy level or are experiencing unexpected weight loss or weight gain, you could benefit from EverlyWell’s Metabolism Test. This test measures TSH (thyroid-stimulating hormone), testosterone and cortisol and tells you if your levels of these three hormones are low, normal or high. TSH is the primary indicator of thyroid health, which has a significant effect on your body’s metabolism. Testosterone influences muscle production and athletic performance. Cortisol, a primary stress hormone, promotes fat storage, mobilization of blood sugar, muscle breakdown and other potentially detrimental effects. With many of these test kits, you can find discounts off the MSRP on Amazon, rather than purchasing them directly on EverlyWell’s website. The following tests give you the same results as the corresponding blood tests plus DNA analysis. EverlyWell often has discounts off MSRP on Amazon. EverlyWell’s process is extremely straightforward to follow. Order your test kit online. You’ll receive your EverlyWell kit within 5 days (possibly sooner if you purchase through Amazon and have Prime). Use the barcode on the test kit to register your kit online. Follow the collection instructions carefully. Depending on the test, instructions may tell you not to eat or brush your teeth before you collect your sample. Place your sample in the collection tube or package provided in your kit. Mail your kit in the prepaid envelope. Your results will be available online within 5 days, once the lab receives your collection. Are you worried about doing a blood test at home? Watch the following video to see how easy EverlyWell’s collection process is. Some of its tests are straightforward blood tests like those you’d get at your doctor’s office — and are just as accurate. EverlyWell merely gives you the option of testing at home, rather than at your doctor’s lab. You can then share your results with your physician to develop an actionable plan if your results are abnormal. A few of its tests, including the food sensitivity test, are more questionable from a scientific standpoint. In fact, some allergy experts question the science behind the food sensitivity test. They say this test doesn’t analyze all factors associated with food sensitivity. Also, keep in mind that the tests analyzing various hormone levels (e.g., heart health, women’s fertility and metabolism) only look at a finite number of hormones and don’t take other physical and environmental influencers into account. Ultimately, they only give you a small window into the overall view of your health. With that said, EverlyWell tests can be a good starting point for you to learn if you have any health problems relating to symptoms you’ve been experiencing. But — and this is a big but — these tests should never be used as a self-diagnosis (except EverlyWell’s sexual health tests) nor substituted for your physician’s input. There are far too many factors that can cause fatigue, digestive problems, headaches and other symptoms, so a visit to your physician is critical. Do you have ongoing digestive issues? In addition to taking EverlyWell’s food sensitivity test, you can learn about the microbes that live in your gut. Check out our reviews of the best gut microbiome testing companies to learn more. Other companies, like 23andMe, offer at-home DNA tests to discover more about your health. Our reviews of the best DNA tests for health reasons can give you more options to consider. What do you think about at-home consumer health and DNA testing?